(Nanowerk Spotlight) Nanoparticles are of great scientific interest as they are effectively a bridge between bulk materials and atomic or molecular structures. Nanoparticles that consist of crystals of tens to thousands of atoms have been synthesized and used as "artificial atoms". In order to develop nanoparticle-based devices, though, it is essential to be able to control the placement of nanoparticles relative to one another. Two- and three-dimensional crystals of nanoparticles can be generated in a relatively straightforward manner, but it has been impossible to direct the assembly of the particles with any degree of specificity. The problem is that nanoparticle assembly so far has been constrained by the isotropic interactions between the particles. Isotropic materials have identical values of a property in all crystallographic directions, i.e. they are almost spherical in appearance. Though it is increasingly evident that nanoparticles would become a much more powerful research and engineering tool if it were possible to to enable directional assembly, breaking the interaction symmetry in isotropic materials is a major challenge. Doing so would enlarge the scope of potential applications, because anisotropic assemblies, where the interatomic bond strengths is directionally dependent, have distinctive properties that cannot be found or produced in isotropic assemblies. Researchers at MIT now have reported a simple method to fabricate divalent metal nanoparticles. This work is a first step towards enabling the controllable, directional assembly of nanoparticles into more complex and well-specified structures. "We present an approach to functionalize monolayer protected metal nanoparticles at two diametrically opposed points that exist as a consequence of the topological nature of the particles" Gretchen DeVries explains to Nanowerk. "Specifically, we have made nanoparticles that act as divalent building blocks, and can be reacted with complementary divalent molecules to form chains that can then produce self-standing films." DeVries, a PhD student at MIT's Supramolecular Nano Materials Group (Professor Francesco Stellacci), is first author of a recent paper published in Science ("Divalent Metal Nanoparticles"). On a topological sphere a 2D crystal cannot exist unless two separate point defects are present. This is commonly known as the "hairy ball theorem" that states that, in layman's terms, "one cannot comb the hair on a ball in a smooth manner." One way to understand this theorem is to picture the hairs on a tennis ball: any attempt to make them "smooth" in a mathematical sense will leave two spots where two hairs point in drastically different directions. Those two defect points repel each other and thus are required to exist at diametrically opposed positions. The researchers at MIT exploit this repulsive force to gain the ability to make chains. The ligand shell that coats, protects, and imparts a large number of properties to gold nanoparticles is a 2-D self-assembled monolayer wrapped around a 3-D metallic core. Stellacci's group has previously shown that, when gold nanoparticles are coated with two different ligands, phase separation occurs in the ligand shell (" From Homoligand- to Mixed-Ligand- Monolayer-Protected Metal Nanoparticles: A Scanning Tunneling Microscopy Investigation"). This phase separation leads to the formation of concentric, ribbonlike domains of alternating composition. At two diametrically opposed points, or "poles", on the nanoparticle, these ribbons collapse into points. "We have shown these poles to be highly reactive" says DeVries. "Molecules with reactive terminal groups have been placed at these polar positions within the ligand shell of gold nanoparticles. The position of these molecules generates nanoparticles with divalency; that is, they can interact with two other similarly functionalized nanoparticles via these polar molecules. 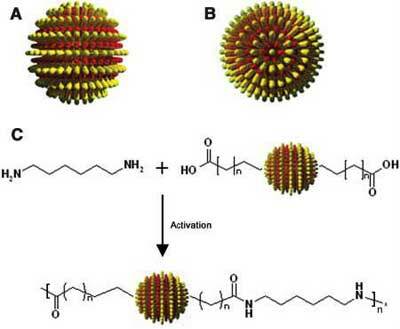 In our work, we placed carboxylic acid terminated molecules at the two polar positions of each nanoparticle and joined the nanoparticles together into chains by reaction with diamine-terminated free molecule. The resulting chains of nanoparticles have been shown to form free-standing films when allowed to dry." With this ability to place molecules at two specific points on a nanoparticle, the MIT researchers have broken the symmetry of isotropic materials and opened the possibility of directional assembly of nanoparticles. A number of devices may be enabled by this strategy of nanoparticle assembly. For instance, a device that specifically requires a one-dimensional assembly of nanoparticles is a sub-diffraction limit nanoparticle-based waveguide. This type of waveguide would allow electromagnetic energy to propagate within a dimension that is much smaller than that allowed by current structures. Such a waveguide was fabricated by the Atwater group at CalTech (" Local detection of electromagnetic energy transport below the diffraction limit in metal nanoparticle plasmon waveguides") and the successful propagation of energy was demonstrated. "With our method of joining nanoparticles together, however, the waveguide is less confined by fabrication parameters imposed by lithographic processes" says DeVries. She points out that her group is continuing their investigation into the mechanism of chain formation to better understand the driving forces behind the ligand ordering and the high reactivity of the polar defect sites. "Additionally, we plan to improve the yield of the synthesis and to extend the method to use with a variety of other materials."